For other uses, see Bathgate (disambiguation). 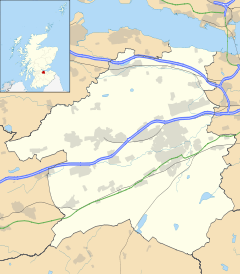 Bathgate (Scots: Bathket or Bathkit, Scottish Gaelic: Both Chèit) is a town in West Lothian, Scotland, 5 miles (8 km) west of Livingston and adjacent to the M8 motorway. Nearby towns are Armadale, Blackburn, Linlithgow, Livingston, West Calder and Whitburn. Situated 2 miles (3 km) south of the ancient Neolithic burial site at Cairnpapple Hill, Bathgate and the surrounding area show signs of habitation since about 3500 BC. Bathgate first enters the chronicles of history in a confirmation charter by King Malcolm IV of Scotland (1141 – 9 December 1165). In royal charters of the 12th, 13th and 14th centuries, the name of Bathgate has appeared as: Bathchet (1160), Bathket (1250) and Bathgetum (1316). Batket in the 14th century, and by the 15th appeared as both Bathgat and Bathcat, the latter an offshoot of Uchtred Dalrymple's feudal lineage, which ruled during ancient times. The name is a "manifest corruption" of an earlier Cumbric name meaning 'Boar Wood' (cf. Welsh baedd coed). Early records of Bathgate are somewhat sketchy. It is recorded that, around 1160, Uchtred Dalrymple, Sheriff of Linlithgow, and Geoffrey de Melville came to Bathgate at the command of King Malcolm IV and measured out an area of land which was to form the basis of Bathgate Parish. The church and all its associate property were placed under the auspices of Holyrood Abbey at that time and paid a tenth of its income from the land to that institution. In 1315, the daughter of King Robert I of Scotland (Robert The Bruce), Marjorie (alternatively spelt Margery) Bruce, married Walter Stewart (or Steward) (1293–1326), the 6th Lord High Steward of Scotland. The dowry to her husband included the lands and castle of Bathgate. Walter died at the castle on 9 April 1326. This marriage is still celebrated in an annual pageant forming part of the Bathgate Procession & John Newland Festival, colloquially known as the Bathgate Galaday (or Gala day). Dating from around the same time the remains of Bathgate's former parish church still stand at Kirkton. The original 12th-century construction was absorbed by a later build in 1739 when a new church was erected on the same site. The walls of the church were consolidated in 1846. This simple whitewashed edifice served the community until its last service on 9 April 1882. King Malcolm IV makes reference to the original church in a charter, granting it to the monks of Holyrood Abbey. Records show that Holyrood Abbey gave the church to the abbot and monks of Newbattle Abbey in 1327. In 1606 silver ore was found at nearby Hilderston, in the shadow of Cairnpapple Hill, by a prospecting collier, Sandy Maund. This accidental discovery began a short-lived crown "project" in the area. Advisers to King James VI of Scotland became aware of the mine and in April 1608 repossessed the land for the crown. By December 1608 it was clear that the ore in the mine was of varying quality and by March 1613 all efforts to extract silver from the area were abandoned. His depiction goes on to describe how the half the army perished in the freezing weather as they headed towards the Pentland Hills. Established around 1800, the Glenmavis Distillery in Bathgate was purchased in 1831 by one John McNab, who produced the eponymous MacNab's Celebrated Glenmavis Dew from the site until the distillery's closure in 1910. In 1885, the distillery was producing 80,000 gallons of single malt a year which was transported to Scotland, England and the colonies. In 1831 Bathgate Academy was built. Designed by the Edinburgh architects R & R Dickson this is Bathgate's only large public building of historic merit. It was endowed by a Jamaican plantation owner John Newlands. By the opening of Edinburgh and Bathgate Railway in 1849, local mines and quarries were extracting coal, lime, and ironstone. James Young's discovery of cannel coal in the Boghead area of Bathgate, and the subsequent opening of the Bathgate Chemical Works in 1852, the world's first commercial oil-works, manufacturing paraffin oil and paraffin wax, signalled an end to the rural community of previous centuries. When the cannel coal resources dwindled around 1866, Young started distilling paraffin from much more readily available shale. The landscape of the Lothians is still dotted with the orange spoil heaps (called bings) from this era. Collieries and quarries and the associated industries (brickworks, steelworks) were the main employers in Bathgate as the 19th century drew to a close. In the mid-20th century, many local industries were closed and West Lothian was designated a Special Development Area. In such areas, extra financial inducements were offered by the British government to assist companies wishing to relocate. As a result, in 1961, the BMC—which consisted of the merged Austin Motor Company and Morris Motors—located a new truck and tractor plant in Bathgate rather than expanding their Longbridge plant as originally planned. The plant closed in 1986. On 24 March 1986, the Bathgate-Edinburgh railway line was re-opened to passengers for the first time since the 1950s. This railway line was extended as the Airdrie-Bathgate Rail Link to Airdrie allowing train services to run between Glasgow Queen Street and Edinburgh Waverley via Bathgate on time and on budget in December 2010. The world's oldest known reptile fossil, Westlothiana lizziae (affectionately referred to as Lizzie), was discovered in East Kirkton Quarry, Bathgate in 1987; it is now in the Museum of Scotland. Early in 1992, the US company Motorola opened a mobile phone manufacturing (Personal Communications Sector or PCS) plant at Easter Inch in Bathgate (now the Pyramids Business Park). In 2001, the global market for mobile phones dropped sharply and as a consequence, despite pressure from the highest levels of UK government, on 24 April 2001 Motorola announced the closure of the plant and the loss of 3,106 jobs. The 93-acre (380,000 m2) site is now occupied by HMRC. Notable Bathgate residents have included Debbie Geddes, Bernard Gallagher, former captain of the Ryder Cup Team, David Tennant (born in Bathgate but raised in Paisley); his father Alexander McDonald, former Moderator of the General Assembly of the Church of Scotland; Sir James Young Simpson, the discoverer of the anaesthetic properties of chloroform; and John Newland, one of the town's major benefactors. Newland emigrated to the West Indies. There he became a rich planter, using slaves to maintain and harvest his sugar-cane crop. His benefaction allowed the establishment of Bathgate Academy, which was founded in 1833. He is remembered today by an annual pageant (known as the Procession or Newland's day), held on the first Saturday in June. The local secondary schools are Bathgate Academy and St Kentigern's Academy. The Bathgate primary schools are Balbardie, St Mary's, Boghall, St Columba's, and Windyknowe. A new primary school, Simpson Primary, opened on the site of the British Leyland Factory in August 2007. It serves the new area of town called Wester Inch. The school is named after James Young Simpson. Bathgate was an industrial town in its time. It played host to the Menzies' Foundry (demolished due to the railway link construction) and British Leyland was sited in Bathgate. It had two train stations, Bathgate North and South. There was a link that ran from the site of the current station, along Menzies Road, at the rear of one side of Mill Road all the way to Easton Road where the station was. This was used for the coal-mining industries and the foundries. Bathgate has easy access to the M8 Motorway via Junctions 3A and 4, linking the town to Edinburgh, Inverclyde via Glasgow and Towns in between. The A801 links Bathgate to the M9 via Polmont. Bus Services in Bathgate are co-ordinated by West Lothian Council and are provided principally by First Scotland East, SD Travel and E&M Horsburgh. Frequent and daily direct services exist to Falkirk, Westfield, Armadale, Blackridge, Whitburn, Fauldhouse, Torphichen, Linlithgow, Broxburn, Uphall, Newbridge, Deans, Livingston, East Calder and Edinburgh. Edinburgh Airport is 13 miles (21 km) away. Richard Bladworth Angus — Scottish-Canadian financier, banker, and philanthropist; co-founder of the Canadian Pacific Railway. Bathgate has a great variety of shops. In the late 19th century the co-operative halls were built and served the community until closure in the 1980s. It provided a bakery, butchery, funeral parlour, grocery store, clothing, furniture and a dance hall. Even after the closure the co-operative dance hall was used as the Room At The Top. It caught fire in 1997. Bathgate is also home to a popular nightclub called The Twig, located at the end of Livery Street. There are local and chain stores as well such as Greggs, W.H. Smith, Home Bargains, B&M, Tesco, Bathgate Bargain Stores, Aldi, Argos, Costa Coffee, Lidl, Morrisons, and McDonald's. Bathgate is home to the junior football club Bathgate Thistle, who won the Scottish Junior Cup in 2008. They play at the Creamery Park. Their stadium is also used for activities such as football roadshows. Bathgate FC were active between 1893 and 1938 and played at Mill Park. Paul di Resta, former Formula One driver with Sahara Force India and now driving for Mercedes in the DTM touring car series, grew up in the town of Bathgate. He won many admirers in his rookie F1 season of 2010 and had been tipped to land a seat at a constructor challenging higher up the grid in the coming seasons, but ultimately returned to DTM in 2014 after failing to secure an F1 ride for that season. He is cousin to two other notable drivers who also hail from Bathgate—the now-retired multiple IndyCar champion Dario Franchitti and his younger brother Marino, currently racing sports cars in Europe and North America. Part of the M8 Art Project saw the artist Patricia Leighton's 'Sawtooth Ramps' project being built in 1993, now more commonly referred to as the Pyramids. The sculpture is 1,000 feet (300 m) long and consists of seven 36-foot (11 m) high ramps. The artist based the design on local geographic features (drumlins) and the shape of the surrounding bings. The pyramidal shape of the sculpture gave rise to the name of the nearby Pyramids Business park. In April 2007, a local farmer painted the sheep which graze on the pyramids bright red with a harmless sheep spray. In 1998 the artist Lumir Soukup built the earth sculpture The Bathgate Face at Wester Inch. By taking facial measurements of more than 1200 Bathgate residents, the artist was able to create an 'average profile' which was the basis for the sculpture. Development in the area in 2004 threatened to demolish the sculpture but the artist managed to persuade developers to build around his work. Bathgate was also home to rock band Goodbye Mr Mackenzie in the 1980s and 1990s, a success of the local college's Music Industry course. ^ "Area Profile: Bathgate Locality". Scotland's Census Results Online. 2011. Retrieved 26 November 2015. ^ "Publications and Data". General Register Office for Scotland. Archived from the original on 16 September 2009. Retrieved 9 May 2010. ^ Price, Glanville, Languages in Britain and Ireland (page 122); Bethany Fox, 'The P-Celtic Place-Names of North-East England and South-East Scotland', The Heroic Age, 10 (2007), http://www.heroicage.org/issues/10/fox.html (appendix at http://www.heroicage.org/issues/10/fox-appendix.html). ^ Cavanagh, Cybil (2006). Old Bathgate. Catrine, Ayrshire: Stenlake Publishing. p. 3. ISBN 9781840333770. ^ "Bathgate Castle". Retrieved 22 December 2012. ^ "sasaa king jamie's silvermine". Sasaa.co.uk. Retrieved 1 September 2011. ^ "Edinburgh and Bathgate Railway". ^ "New £300m Airdrie-Bathgate rail link reopens". BBC News Online. BBC. 12 December 2010. Archived from the original on 12 December 2010. Retrieved 27 December 2010. ^ "BBC News: Motorola to close Scottish plant". 24 April 2001. ^ "Case Study Company: Motorola, Easter Inch, Bathgate". Scottish Enterprise Edinburgh and Lothian. ^ "George Macbeth Menzies - Obituary". The Independent. London. 1 February 2003. Retrieved 28 June 2011. ^ "West Lothian Council Public Transport". ^ "George Macbeth Menzies - Obituaries, News". London: The Independent. 20 February 2003. Retrieved 1 September 2011. ^ "projects". Art in Partnership. Archived from the original on 25 September 2006. Retrieved 1 September 2011. ^ "BBC NEWS: Edinburgh and East - Sheer brilliance for bright sheep". BBC News. 3 April 2007. ^ Bradley, Jane. "Edinburgh Evening News". Edinburghnews.scotsman.com. Retrieved 1 September 2011. Wikimedia Commons has media related to Bathgate.